Latest figures taken from the Construction Industry Scaffolders Record Scheme (CISRS) database show that the 50,000 mark for CISRS card holders has been breached. This is a significant achievement and is by far the highest number of current valid cards the scheme has ever held since its inception in the late 1960’s. In a climate which has seen some card schemes come under scrutiny from the wider industry, CISRS seems to be one of the few schemes which is bucking the trend. During the recent series of independent reports into card schemes and competency carried out by Pye Tait, CISRS was highly praised for its rigorous approach to qualification through the combination of formal off site training at approved training centres, on site time served experience, S/NVQ assessment, practical skills tests and Health and Safety testing. 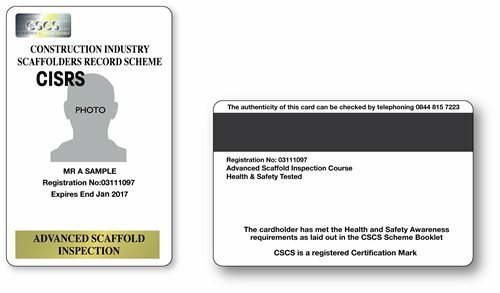 A lot of the areas which were highlighted as lacking in other card schemes are well established within the scaffolders training and assessment programme. CISRS has always been quick to respond to changes in the industry and has strived to ensure a robust approach to sector competence. In 1996 it was one of the first schemes to include the S/NVQ Level 2 and 3 within its programme. In 1999 the newly introduced Construction Skills Certification Scheme (CSCS) approached CISRS to be one of its founder affiliate organisations. In the early 2000’s, the card renewal scheme which imposed a requirement for a Health and Safety testing on a five yearly basis was also embraced by CISRS. The requirement for renewal did for a short period have quite a dramatic effect on card scheme numbers: For example, in 2004 there was a total of only 15,526 current card holders listed. The scheme’s ethos of quality over quantity has endured and due to this the card’s status amongst the wider industry has gone from strength to strength making it a mandatory requirement in almost all areas of the sector. When the scheme was initially introduced 40 years ago, there still existed the opportunity to apply for a card under “grandfather rights” or “industry accreditation” based upon industry experience and an employer’s declaration. Although many of the initial cardholders obtained their CISRS status via this method, the completion of Part 1, Part 2 and Advanced training courses soon became the only established route into the CISRS scheme and it has remained that way for over 30 years since the withdrawal of Grandfather rights. The scheme continues to move forward. 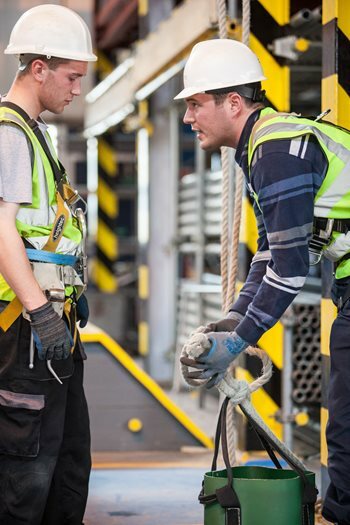 The last eight years has seen the introduction of System Scaffold Product Training Scheme (SSPTS), Basic and Advanced Scaffold Inspection Training Scheme (SITS) and a mandatory one day course requirement for New Entrant Trainees and Scaffolding Labourers prior to registration CISRS Operative Training Scheme (COTS). And a full scheme review is currently underway in order to ensure any relevant industry changes are incorporated to the core scheme Part 1, Part 2 and Advanced programmes. The new Part 1 package (which is due to be issued to approved providers by the end of December 2014) will incorporate additional training on TG20:13, Mobile Access Tower (Aluminium Tower) training for scaffolders and a Scaffold inspection module. The package will include PowerPoints, lesson plans, drawings, supporting literature, training modules etc. The standardisation working party will reconvene in early January to start work on Part 2. For further details about CISRS card courses, training changes following the introduction of TG20:13, information and dates on courses available, a list of approved training providers or to find out more about CISRS, please visit www.cisrs.org.uk or email enquiries@cisrs.org.uk. 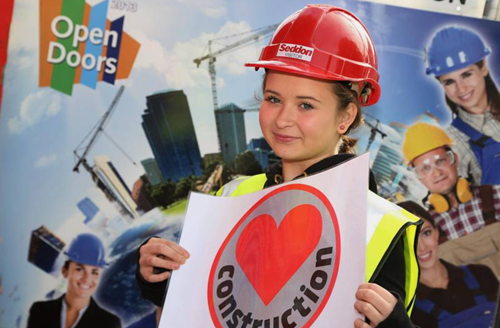 The NASC is supporting the 2015 ‘Open Doors Weekend’ campaign, organised by the UK Contractors Group (UKCG), the Scottish Contractors Group (SCG), the Construction Industry Training Board (CITB) and Sector Skills Council, the Chartered Institute of Building (CIOB) and the Considerate Constructors Scheme (CCS). The initiative aims to “give a unique opportunity to have a ‘behind the scenes’ look at 100+ major construction sites for more than 3,000 people, in a safe, exciting and unique environment” on March 6th & 7th 2015. And a variety of interesting sites have already been lined up from from top contractors and developers such as VINCI, BAM, Midas and Galliford Try. In addition Kier, Carillion, Mace, Morgan Sindall, Wates, Sir Robert McAlpine, Mace and many other big names are set to book their sites by the end of the year, in time for the March event, which will also be supported by local MPs and other industry players. Aimed at the 11-16 and 16-24 age groups, teachers, parents and those with an interest in ‘life behind hoardings’, the scheme’s aim is to encourage the next generation of construction workers – including scaffolders, scaffold designers, access provision and other associated work at height careers, hence the NASC support. 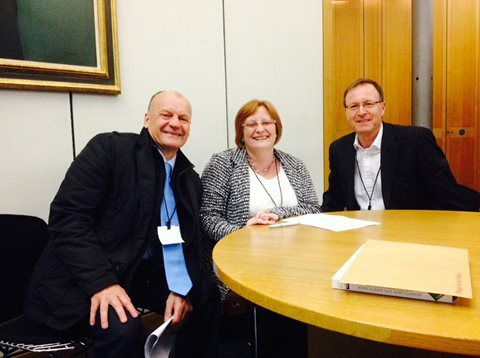 Robin James, NASC Managing Director said: “The UKCG and NASC work closely together on a number of projects. And we are very happy to support this superb scheme, and hope our members and the scaffolding industry get right behind it. Rachel Done of the UKCG said: “UKCG are very pleased to have NASC support for Open Doors Weekend 2015. 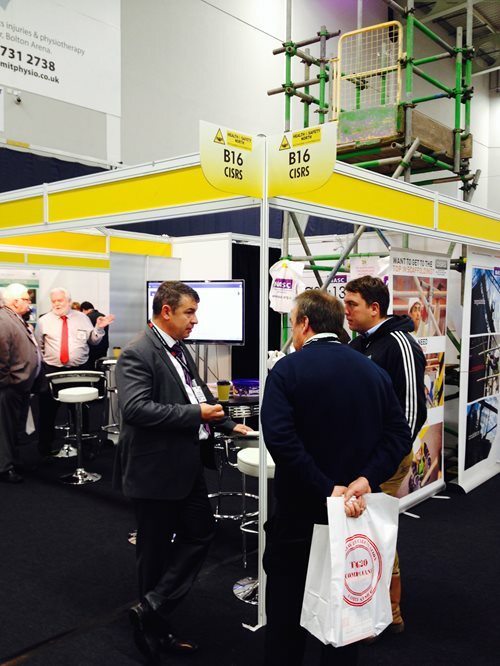 NASC members make a vital contribution to the safe construction of projects. Registration for the event and information can be found at: www.opendoorsweekend.co.uk & via the UKCG’s other ‘Born to Build’ initiative at: www.borntobuild.org.uk and via their social media platforms on Facebook here and Twitter here (@OpenDoorsWknd & @borntobuilduk) where the hashtag #doors2015 is being used to identify the campaign. For details about getting into the scaffolding industry and becoming an NASC member, or to find out more about TG20:13 and the NASC – the scaffold industry trade body – please visit www.nasc.org.uk or email: enquiries@nasc.org.uk. The NASC’s well-attended Annual General Meeting took place at the iconic Midland Hotel in Manchester city centre on Friday 21st November. In a packed agenda, NASC MD Robin James reported on the recent publication of the new look NASC 2015 Yearbook, the sales success of the organisation’s “good practice guide for tube and fitting,” TG20:13, the publication of new and revised Safety and Technical guidance, Qualifying the Workforce Funding and the recent promotional work of the organisation at 2014 events, such as the Safety & Health Expo at London’s ExCeL and Health & Safety North in Bolton. 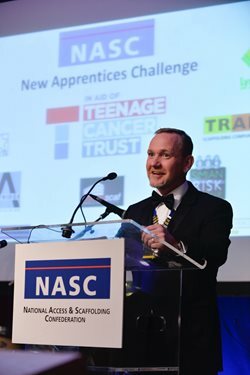 NASC President, Kevin Ward then updated those present on his New Apprentices Challenge – the plan to create 400 new scaffolding apprenticeships during his two year tenure, simultaneously raising money for the Teenage Cancer Trust (TCT). Mr Ward informed the membership that 230 new apprentices have been created by NASC member companies since the scheme began 12 months ago. This equates to more than £25,300 being raised for TCT – at the half way point of the scheme. Special mention was made of Seabro Ltd who are currently topping the New Apprentices Challenge league – with 16 new apprentices commencing training during this period. And credit was also given to other member companies in double figures, with Interserve Industrial Services Ltd on 14, Connect Scaffolding Ltd on 11 and B J Champion Scaffolding Ltd, Lyndon Scaffolding plc, TRAD Scaffolding Co Ltd and UK Access Solutions Ltd all with 10 new apprentices each. Mr Mosley also announced the NASC’s inaugural Apprentice of the Year Award winner – Josh Kerwin of Kaefer C&D Ltd – along with runners-up, Dean Fry (Chris Sedgeman Scaffolding Ltd) and Matt Wernham (Connect Scaffolding Ltd). It is expected that there will be no shortage of entries for the 2015 award, thanks to the New Apprentice Challenge. 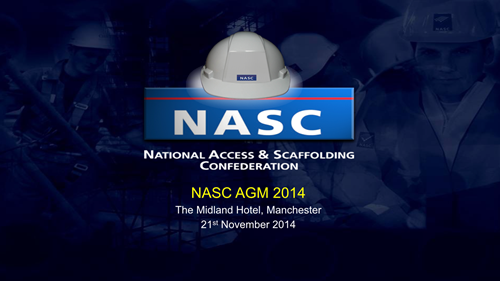 In conclusion, NASC MD Mr James announced that the 2015 NASC AGM and Annual Ball will be held in Leeds. For details about becoming an NASC member and to find out more about the New Apprentices Challenge, TG20:13 and the NASC – the scaffold industry trade body organisation – please visit www.nasc.org.uk or email: enquiries@nasc.org.uk. The NASC announced the results of its inaugural Apprentice of the Year Award at its Annual General Meeting in Manchester on Friday 21st November. The new NASC Apprentice of the Year scheme – sponsored by both the Construction Industry Training Board (CITB) and Construction Industry Scaffolders Record Scheme (CISRS) – is aimed at individuals who are directly employed by an NASC Member company and are either part way through a formal scaffolding apprenticeship with an approved CISRS provider, or alternatively have successfully completed the apprenticeship programme in 2014. The winner was selected by scheme judge and Scaffolding Specialist Account Co-ordinator for the Construction Industry Training Board (CITB), Diane Wood. 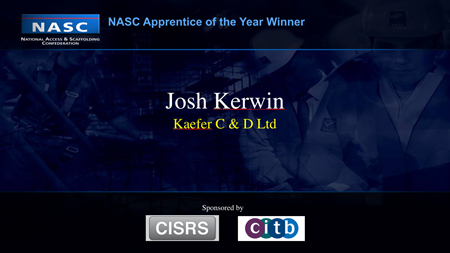 It was announced during the AGM, that the winner of the very first NASC Apprentice of the Year award was Josh Kerwin of Kaefer C&D Ltd in Mansfield. Josh will receive a trophy and a cash prize of £500, whilst the apprentice’s employer Kaefer C&D Ltd. will also receive a trophy and £500 to be spent on CISRS training with an approved provider. These prizes will be officially presented by NASC Director of Training and CISRS Scheme Manager, Dave Mosley, at the workplace of the winner at a mutually convenient date. A special mention was also given to the two runners-up for the 2014 award, Dean Fry of Chris Sedgeman Scaffolding Ltd and Matt Wernham of Connect Scaffolding Ltd, both of whom will also receive a trophy to recognise their efforts whilst working towards the achievement of their apprenticeships. 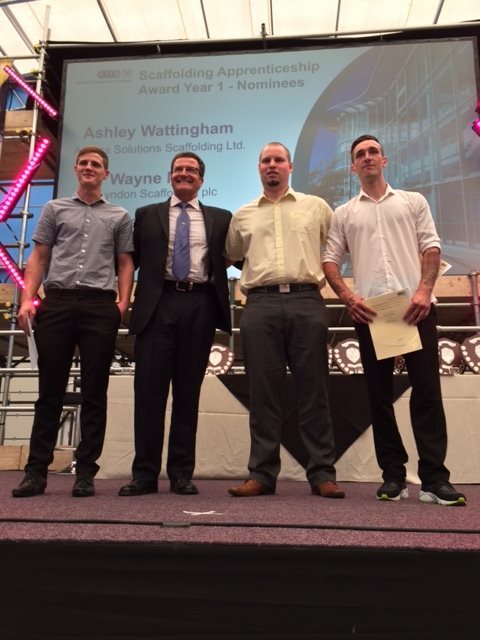 CITB’s Diane Wood said: “Josh originally started as a yard lad in 2011. He then applied for a labourer’s job and worked for a year labouring before moving into the Scaffold Division and starting an apprenticeship. He has not only overcome his own personal challenges of working away from home while so young, but has helped others – in particular another team member who was finding it difficult attending college and being away from home. Joshua’s support enabled this person to continue at college. Dave Mosley, NASC Director of Training and CISRS Scheme Manager said: “Congratulations to Josh for winning in this inaugural year and Dean and Matt as runners-up. NASC members have a very long history of supporting scaffolding apprenticeship, which spans over four decades: We have sponsored the Annual NCC Scaffolding Apprentice Awards for almost as long. We were very happy to accept the offer of CITB and CISRS to help us set up our own NASC Apprentice of the Year prize in order to recognise the hard work and commitment of both the employer and employee. 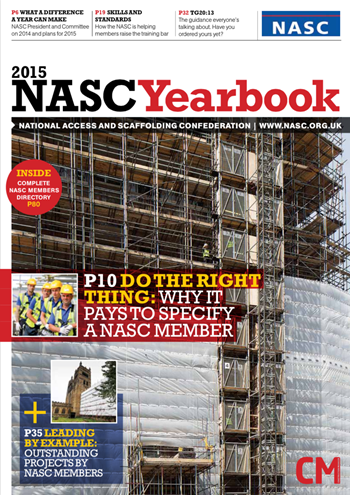 To obtain a hard copy of the 2015 Yearbook or for further details about becoming an NASC member and to find out more about the NASC – the UK scaffolding industry trade body – please visit www.nasc.org.uk or email: enquiries@nasc.org.uk. 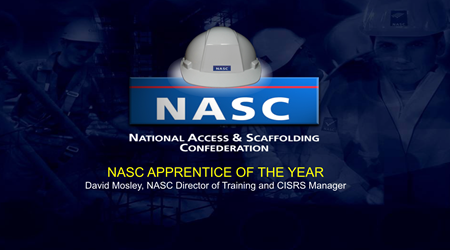 The NASC President’s ‘New Apprenticeship Challenge’ to create 400 scaffolding apprentices in his two year term has gained momentum recently – with the news that NASC member Access Solutions Scaffolding Ltd has joined the list of 10 other NASC member companies which are sponsoring the challenge’s charitable element in aid of Teenage Cancer Trust (TCT). This now means the 11 charity sponsoring NASC member companies are collectively donating £110 to TCT for each new apprentice started by an NASC member up to the target number, potentially raising £44,000 at the end of the challenge in November 2015. NASC President, Kevin Ward will be announcing the good news and providing an update on the scheme’s progress to date at the confederation’s AGM in Manchester later this month – one year on from its launch, following his inauguration as President in November 2013. It is hoped that apprentice numbers will be at or over the 200 mark, equating to more than £22,000 raised for The Teenage Cancer Trust, to date, at the halfway point. For details about and updates on the New Apprentices Challenge and Teenage Cancer Trust, please visit here. For more information about becoming an NASC member, or to find out more about TG20:13 and the NASC – the scaffold industry trade body organisation – please visit www.nasc.org.uk or email: enquiries@nasc.org.uk.